Ah! I made it. 2.5 days of training...great information....good food...and lots of new friends! Of course, it is always good to be back home. I was greeted with warm weather, a ridiculously excited dog, a hungry cat, and a refrigerator full of vegetables. I am so happy I went grocery shopping before I left. It is nice to come home to food! Preparation FTW! I will miss having all my meals prepared and waiting for me, but I am ready to go back to my normal one-pot meals and eating my way through all the fresh veggies I have on hand. Scrambled eggs and bacon. 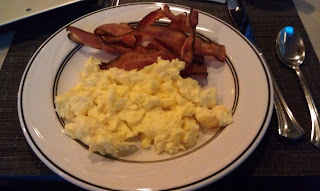 LOTS OF BACON. It was super crispy...just the way I like it! This picture doesn't do this meal justice but it really hit the spot. I wasn't too hungry by 12 pm, but knew that I had a long day of travel ahead so I attempted to fill up. I had a warm spinach salad that included hard boiled eggs, bacon, mushrooms and onions all sauteed in EVOO. 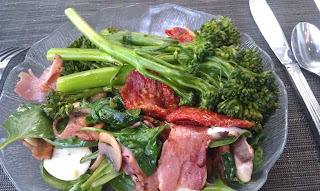 On the side was a large helping of broccolini and roasted tomatoes. PERFECT lunch! Home at last. I fixed my version of comfort good. 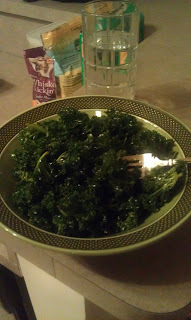 A large bowl of kale dressed with lemon and olive oil. It was refreshing and just what I needed after a very long day of travel. It was good enough to eat two bowls! Yes...I am now turning green from too much kale. Off to bed. Tomorrow will be a busy day of playing catch up after being out of the office for 2.5 days.